I think I’ve mentioned that we live in town. And it’s been a great transition-home for this Los Angeles transplant. Being in town means we’re close to things like the Museum of the Rockies, the library, parks and classes for the kiddos. There’s a Children’s Museum, a world class gymnastics program and at least three indoor pools. We’re close to skiing. Close to grocery stores. Close to Target. To Costco. Close to the Gap. We’ve even got a double lot, so there’s plenty of room for us to have a functional garden, and lots of room for the dogs (Henry and Hitcher) to get exercise and hang out. I’ll admit, though, there are some downsides to being in town. Like… we’re close to Target. And Costco. And the Gap. But the big thing for us is …we have three horses. And our backyard is pretty big. 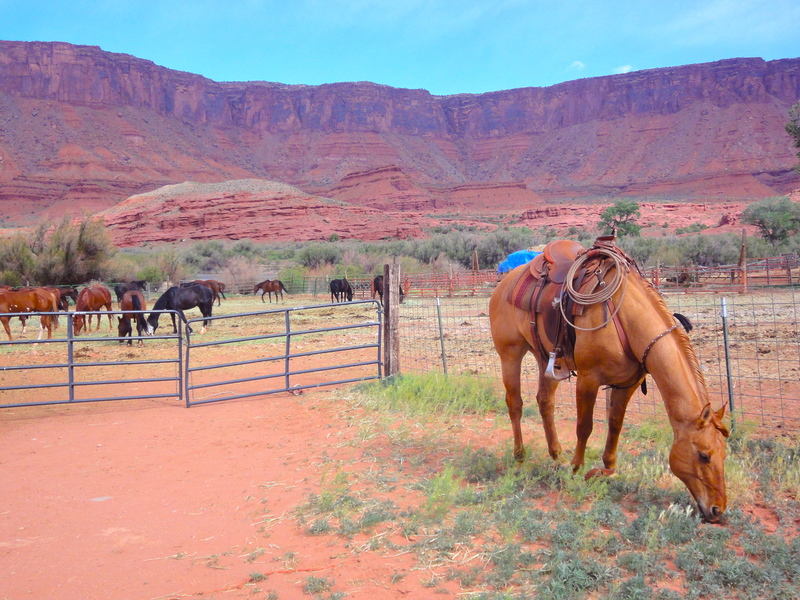 So we keep our horses out in the town of Gallatin Gateway, at the home of our friend Suzy B. Suzy lives in an updated farmhouse on more than a few acres about 20 minutes from our home … with an amazing view of the Spanish Peaks. It’s sort of exactly the kind of home you might imagine everyone in Montana wants to live. And the setting is just one reason I love to take the kiddos out there as often as I can. Another reason is because Suzy is just incredibly cool. But this post isn’t about Suzy. I’m going to save that for another time. Rez. Named after the Yakima Indian Reservation from whence he came, Rez is all man. 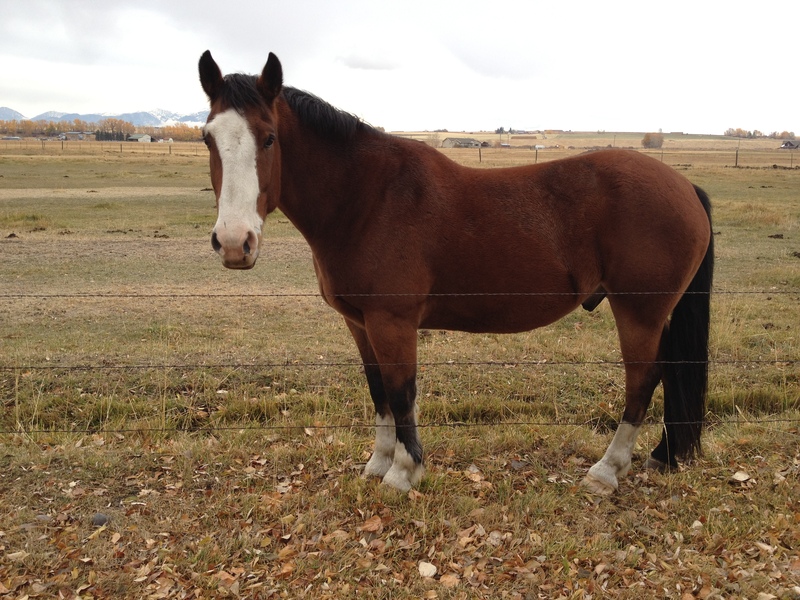 A Red Dun Quarter Horse. Sixteen hands. Strong. Like the Cowboy who rides him. Rez is like the quarterback on a high school football team. The popular guy. Some attitude. A little bit aloof. But charming all the same. He even sort of has a sense of humor. I think he does, anyway. Then there’s Blue. She’s the youngest of the bunch. She’s the horse that the Cowboy bought for his little girl when she was born. 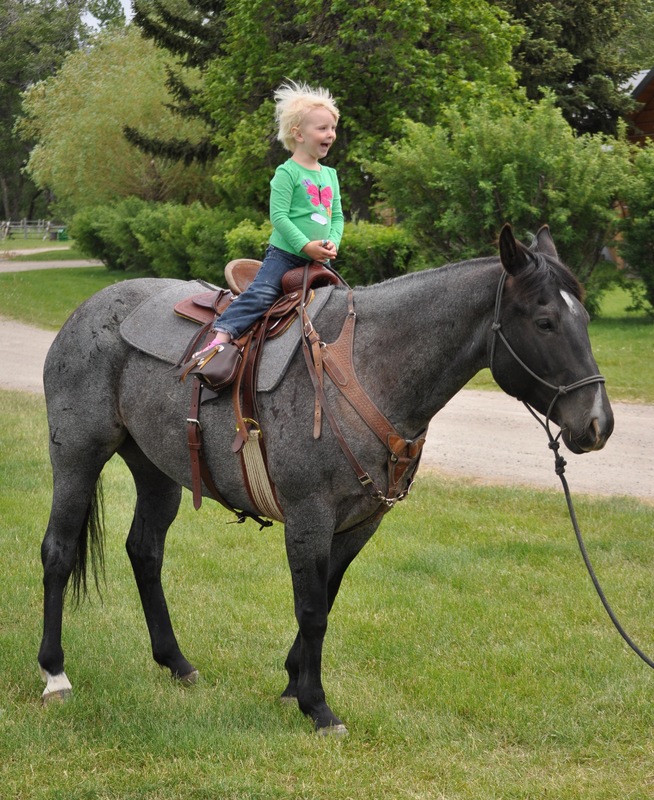 (She’s also from White Swan, the Yakima Reservation) … A Foundation-bred Blue Roan Mare. Fifteen hands. Sassy. Flirtatious. She doesn’t like me all that much. She doesn’t like Suzy too much either (we think it’s a gal thing, because she loves the Cowboy). But she’s gentle as an angel with our little one … so we’ll keep her. 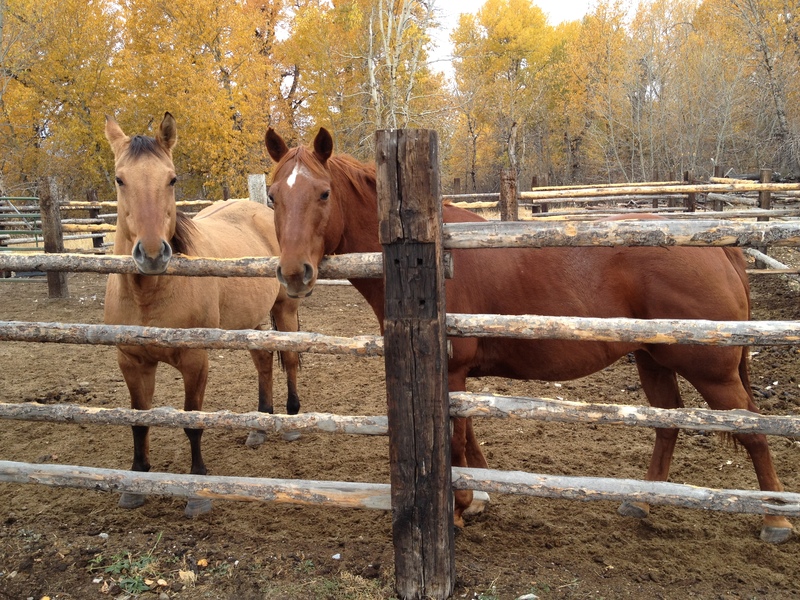 And, of course, there are Suzy’s horses … Liberty and Sugar. Liberty reminds of Pinky Tuskadero (maybe you know the reference? Is Happy Days still on Nick at Nite?) She’s sort of the leader of the girl gang … if there was a girl gang. Don’t mess with Liberty. And Sugar. Well. I’ll say this. Sugar is as Sugar does. He’s sweeter than his name. And he sure does love apples. And last but not least … the gentle kinda dorky giant … Cadet. He boards at Suzy’s, too. 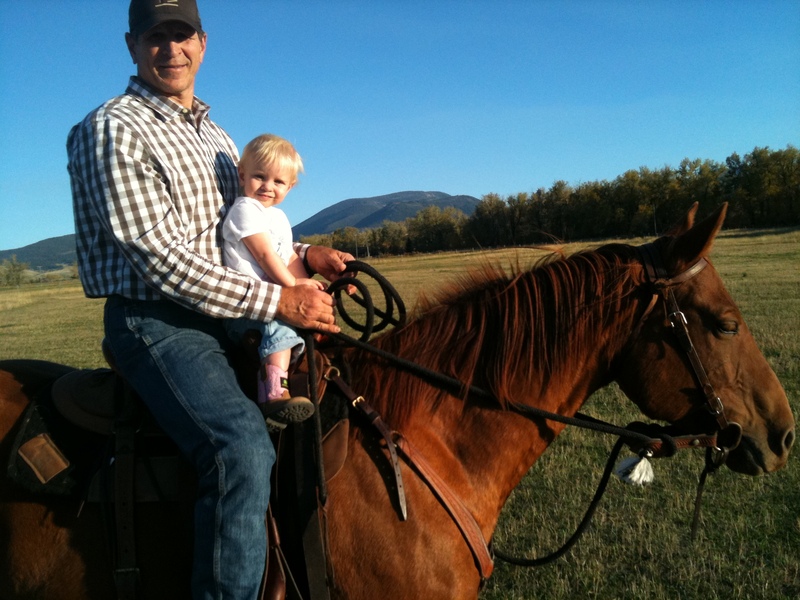 And if Katy ever wants to sell him, I’m going to ask the Cowboy to buy him for our little guy. You see … Cadet is nearly 17.5 hands. HUGE. He’s a Morgan/Clydesdale. And the thing is … our little guy isn’t going to be little for very long. And he’s going to need, a big sweet horse. I’m in LOVE with that picture of your little one on Blue!! !